Back by popular demand!! We are very pleased to announce our highly anticipated Fantastic Recycled T-shirt socks are back in stock!! These are just amazing…everyone loves them and keep telling us how well they wash, how well they wear and how much they enjoy the fun colours. They are a great gift for men and women of all ages and as Solmate says…life is too short to wear matched socks!! How you look at things changes everything. Winter’s not so bad if you look at it the right way and climbing the stairs can be fun too…check it out…this takes stair climbing to a whole new level…pun intended!! Soooo much fun…Sting…Lenny Kravitz…what more could you want? Here’s The Dude in his car wearing the sweater!! Enjoy!! We are very excited about our newest accessories…beautiful, colourful and fun!! Some are reorders, but most are new, and we couldn’t resist these cute & funky new baubles! Spring may not be here yet, but we can pretend, right? A huge Thank You goes out to all of our faithful locals supporting us here at Jammed Lovely! This winter we will be open 7 days a week from 10 to 6!! 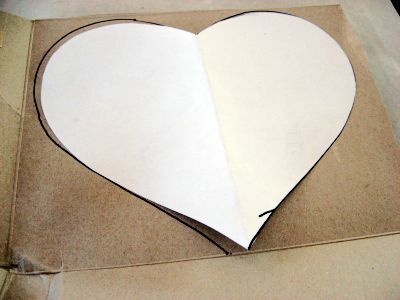 This Valentine’s Day we are collecting handmade Valentines from our customers!!! We will be giving the Valentines to local Senior Citizen’s Homes. 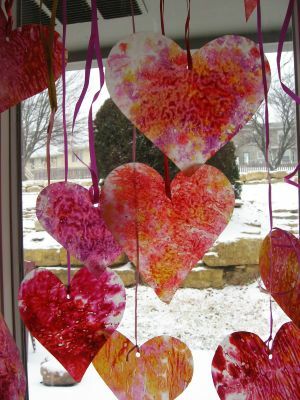 Donate some of your beautiful handmade Valentines by Feb. 11th and you will brighten someone’s day and receive a complimentary gift from Jammed Lovely!! Our goal is at least 100. We can’t wait to see your creativity, so bring them on!!!! As we were searching for ideas for our own Valentine’s Day cards, we came across the cutest Do_It-Yourself Post from skiptomylou and wanted to share it with you. 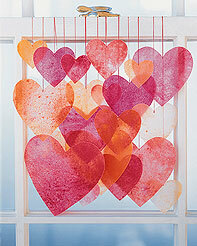 We love Butterfly’s or Flutterby’s and here is a way to combine butterflies and Valentine’s day. How perfect is that? Thank you skiptomylou, we plan on making some to give out as goodies to our friend’s and family. Thank you Skiptomylou for your wonderful Valentine Creativity. 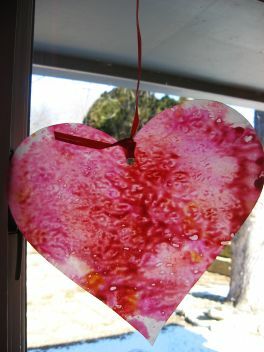 Crayon shavings melted between wax paper and then cut into hearts make a beautiful display in windows. This is an oldie but goodie craft that we love. I can’t think of anything more cheerful or happy hanging from a window.We made lots of crayon shavings with a pencil sharpener. Place shavings on a piece of wax paper. 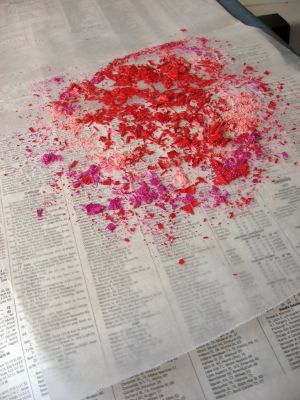 Either place another piece of wax paper on top or fold over the edge to cover all of the shavings. Iron on the lowest setting for about 1 second. You can go always go longer after checking to see if the shavings have melted. Be careful to not burn the wax paper. 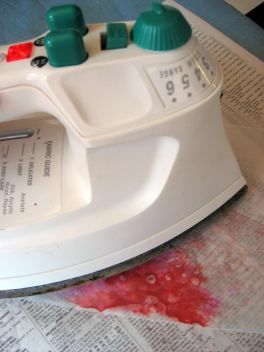 It is a good idea to do the ironing on a piece of newspaper. 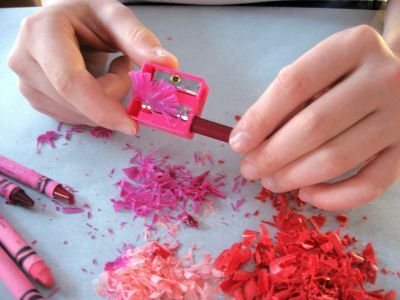 Some shavings could leak out of the sides and it does leave a residue underneath the wax paper. 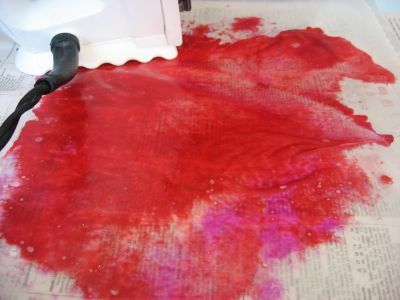 If you are worried about your iron, just place your wax paper between two sheets of newspaper or scrap paper. 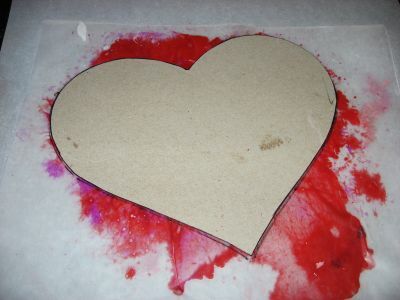 I think it is easiest for kids to trace around cardboard so I took cereal boxes and cut out heart shapes to be used for patterns. This is where you get variety so let the kids draw the hearts. Cut out, hole punch and tie on ribbon, thread or fishing line. Hang!